smoked garlic stuffed bbq brisket over buttered black bean orzo, originally uploaded by aarn! +9th May, 2010+. rubbed a whole side of beef brisket with paprika, sugar, roasted garlic paste, olive oil, salt, pepper, dried mustard powder, garlic powder, tony chachere's creole seasoning, and powdered cayenne pepper. threw the whole side into an offset barrel smoker fired with cherry wood (provided from end cuts from ghd design, the wood shop adjacent to the fringe movement in union square...so it's kind of like recycling). maintained the fire on the brisket so that the thermometer on the smoking chamber read about 200-degrees for about 12-hrs. pulled the brisket and finished it in a 225-degree oven in a deep baking dish over water (steamed it), covered, on a rack, for about 6-hrs, until super tender and falling apart. took a pint of day-old peeled garlic from sherman cafe and tossed it in a pinch of salt and put it in a tin foil pan in the smoker while the brisket cooked, for about 10-hrs. transferred the garlic to a small baking dish filled with enough olive oil to just cover all of the cloves. placed the covered baking dish in a 200-degree oven until the garlic was tender enough to be pierced easily with a toothpick. sauteed a finely minced large shallot in a splash of olive oil and 1T. of butter in a small sauce pan. added a cup of black bean orzo (from christina's spices), and simmered until the orzo had a nice sheen. added fresh thyme, salt and pepper, and then deglazed with 1/2c. of white wine. allowed the wine to reduce for a few minutes, and then added chicken stock in 1/2c. increments (with the pot uncovered) until the orzo was at the right consistency. checked the seasoning, added salt as necessary, then mounted with 2T. butter. stirred until fully incorporated and velvety. rolled up a few slices of the brisket around a handful of the smoked garlic, and the now-solid olive oil binder. threaded two rolls on each skewer, and seared them off over a high-heat grill until nicely marked and hot. 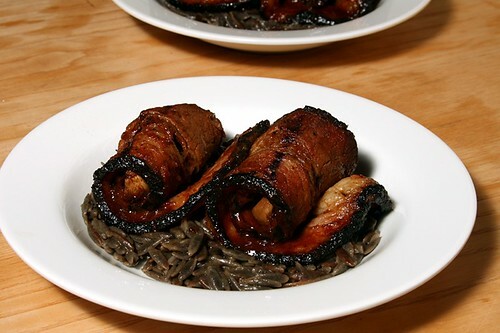 hit the rolled meat with salt and pepper and served over the orzo on warm plates.